The world of software development has changed profoundly in the last decade or so. Once it was a matter of mainly desktop Windows development for the client, mainly Java for server-based applications with web or Windows clients. Then came mobile and cloud – the iPhone SDK was released in March 2008, kicking off a new wave of mobile applications, while Amazon EC2 (Elastic Compute Cloud) came out of beta in October 2008. Microsoft tussled within itself about what to do with Windows Mobile and ended up ceding the entire market to Android and iOS. The consequence of these changes is that business developers who once happily developed Windows desktop applications have had to diversify, as their customers demand applications for mobile and web as well. The PC market has not gone away, so there has been growing interest in both cross-platform development and in how to port Windows code to other platforms. Embarcadero took Delphi, a favourite development tool based on an Object Pascal compiler, down a cross-platform path but not to the satisfaction of all Delphi developers, some of whom looked for other ways to transition to the new world. Founded in 2002, RemObjects had a project called Chrome, which compiled Delphi’s Object Pascal to .NET executables. This product was later rebranded Oxygene. For a while Embarcadero bundled a version of this with Delphi, calling it Prism, after abandoning its own .NET compilation tools. The partnership with Embarcadero ended, but RemObjects pressed on, adding language features to its flavour of Object Pascal and adding support for Mac OS X, iPhone and Java. 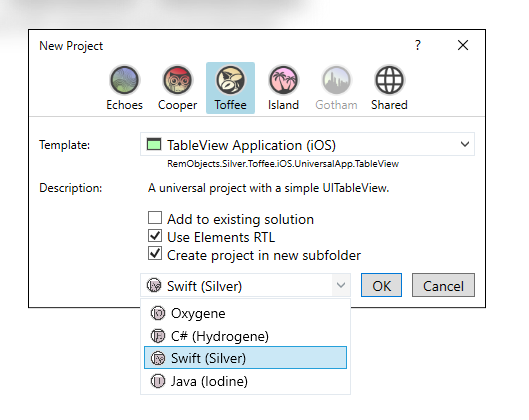 In February 2015 the company was an early adopter of Apple’s Swift language, introducing a Swift compiler called Silver that targets Android, .NET and native Mac OS X executables. Each language can import APIs from the others, and compile to all the platforms – well, there are exceptions, but this is the general approach. As you may spot from the above screenshot, the RemObjects tools use Visual Studio as the IDE. 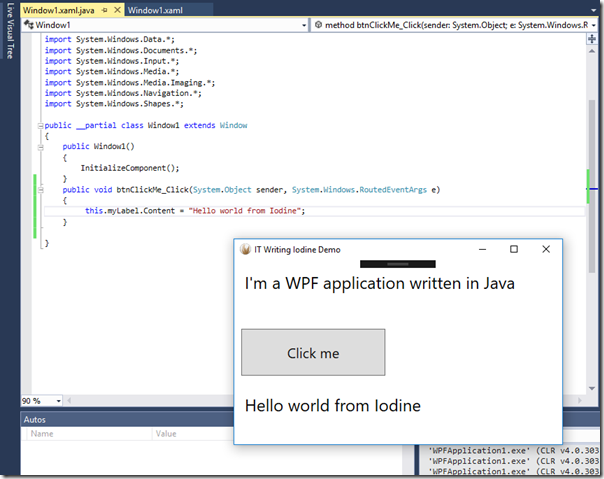 This is a limitation for Mac developers, so the company also developed a Mac IDE called Fire, and now a Windows IDE called Water (in preview) for those who dislike the Visual Studio dependency. Important to note: RemObjects does not address the problem of cross-platform user interfaces. In this respect it is similar to the approach taken by Xamarin before that company came up with the idea of Xamarin Forms. So this is about sharing non-visual code and libraries, not cross-platform GUI (Graphical User Interface). 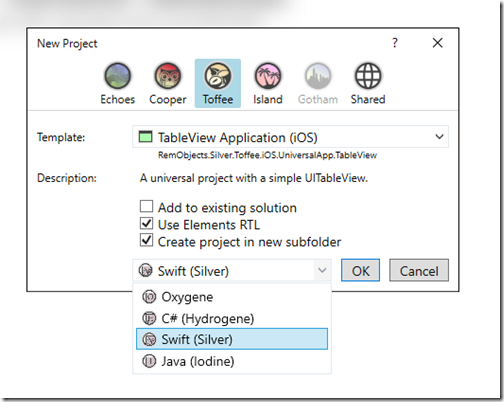 If you are targeting Cocoa, you can use Apple’s Interface Builder to design your user interface, for example. Of course WebAssembly and HTML is an interesting option in this respect. A notable absentee from the list of RemObjects targets is UWP (Universal Windows Platform), a shame given the importance Microsoft still attaches to this. RemObjects is mainly focused on languages and compilers rather than libraries and frameworks. The idea is that you use the existing libraries and frameworks that are native to the platform you are targeting. This is a smart approach for a small company that does not wish to reinvent the wheel. That said, there is a separate product called Data Abstract which is a multi-tier database framework. These are interesting products, but as a journalists I have struggled to give them much coverage, because of their specialist nature and also the demands on my time as someone who prefers to try things out rather than simply relay news from press releases. I also appreciate that the above information is sketchy and encourage you to check out the website if these tools pique your interest.